A chart produced by Statista examines figures taken from market research firm Canalys concerning the Apple Watch's shipment estimates, comparing them with published shipment counts from the Federation of the Swiss Watch Industry, which includes all Swiss-produced watch exports rather than for an individual watch producer. The chart reveals the Apple Watch shipped an estimated 8 million units during the fourth quarter of 2017, more than the 6.8 million Swiss watch shipments over the same period. It is also noted that the Apple Watch saw a year-on-year increase of 2 million shipments, representing growth of 33 percent, while Swiss shipments slightly contracted from 7 million in Q4 2016. Across the entire year, Swiss watches continue to outsell the Apple Watch by a wide margin. Over the year, 24.2 million Swiss watches shipped, while 18.4 million Apple Watches are thought to have shipped during the same time. As well as showing growth, the graph also shows how the two different products are affected differently by seasonality, despite being in the same market. In both 2016 and 2017, most of the Apple Watch shipments took place in the fourth quarter, with 43 percent of annual shipments for 2017 happening during the period. By comparison, Swiss watch shipments are only slightly affected by seasonal shopping habits, with a difference of only 1.3 million between the highest and lowest points on the chart across the two years. 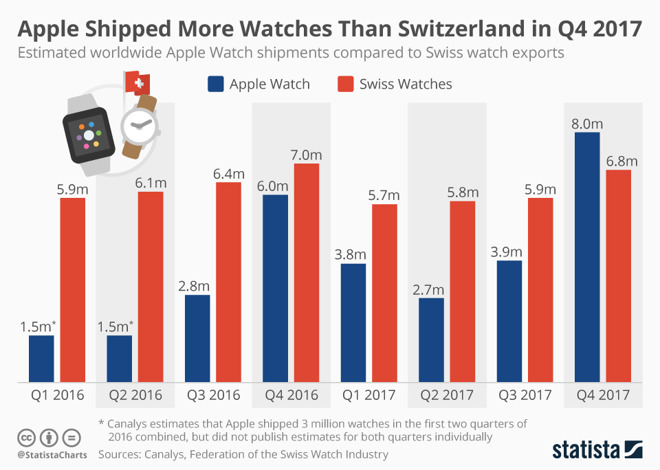 While the chart does show Apple as catching up with —and in one quarter, beating —the Swiss watch industry as a whole in terms of shipments, the numbers do not tell the whole story. Estimates from a market research firm are educated guesses that may still be incorrect, and shipments are also not an indicator of how many units have actually been sold to consumers. The chart also does not indicate how Apple Watch compares to the Swiss watch industry on a financial basis. Considering that the top price for an Apple Watch from Apple directly is $1,399 and that Swiss watches can sell for far higher sums, such a chart will likely point to Swiss watches continuing to earn more revenue than Apple's timepiece for the moment. After its launch, Swiss watch producers have been concerned about how it and other types of smart watches could eat into their revenues, with reports in late 2015 reporting the largest decline for the industry in six years. 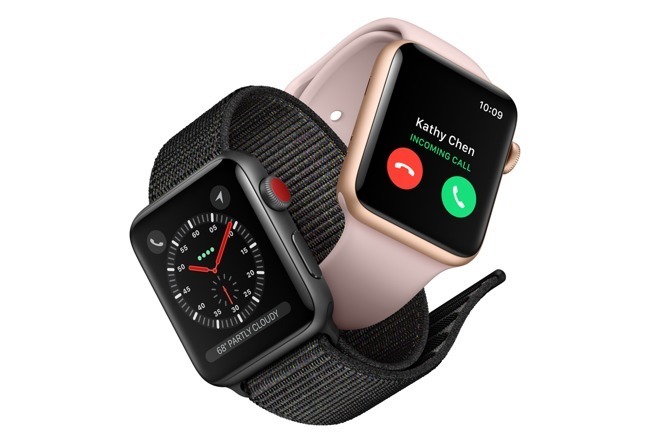 Industry observers did note the Apple Watch as a significant factor in the $2 billion drop, prompting companies such as TAG Heuer to try and enter the market with their own high-priced smartwatches, to limited success.